Broward County is pushing to finish hand recounts by Sunday after missing the deadline last time by just two minutes. NBC 6 anchor Johnny Archer reports. Volunteers gathered around folding tables Friday to begin a painstaking hand recount in Florida's acrimonious U.S. Senate contest, with a goal of determining the intent of about 93,000 voters whose ballots for Republican Gov. Rick Scott or Democratic Sen. Bill Nelson could not be counted by machine. The hand recount is required by state law whenever candidates are separated by 0.25 percentage points or less. Unofficial results showed Scott ahead of Nelson by 0.15 percentage points, or fewer than 13,000 votes out of more than 8 million cast. In Broward County, officials relied on a color-coded system to tally some of the last ballots by hand. Ballots with clear votes for Republican Gov. Rick Scott went into a bin with a red tag. Clear votes for Democratic Sen. Bill Nelson went into one with a blue tag. Blank ballots went into a bin with a yellow tag. Anything that needed further examination by the canvassing board was dropped into one with a green tag. Dozens of volunteers sitting behind the bins stacked on folding tables in a Broward County warehouse cheered loudly when they finished their hand recount Friday morning. Results were not immediately announced. At the election supervisor's office in Tampa, volunteers were joined by observers from both political parties at 12 tables as the recount started. The ballots were in a locked wire basket on a rolling cart when they were delivered to the room. An elections office employee cut the lock off the basket, and the ballots were distributed to the tables, where teams of two volunteers examined each one. The hand recount does not review all votes. It involves ballots that were not recorded by voting machines because voters cast either two votes for one race, which is called an overvote, or appeared to choose no candidate, which is an undervote. The idea is to figure out a voter's intent. Broward County — which experienced numerous problems throughout the election — had the most overvotes and undervotes of any Florida county — almost 31,000. At a Broward warehouse, dozens of volunteers sitting at folding tables cheered loudly when they were told they had finished the recount Friday morning and could go home for the day. Results were not immediately announced. Broward election officials said they uploaded their results two minutes past Florida’s 3 p.m. deadline Thursday and the state is not using the recount results. Instead, state officials are using the first unofficial results that were submitted last Saturday for any county that did not turn in their results on time. Elections official Joe D’Alessandro told the canvassing board the delay was due to his "unfamiliarity with the website" used to upload the results. The contest for governor appeared all but over Thursday, with a machine recount showing Republican DeSantis with a large enough advantage over Democrat Andrew Gillum to avoid a hand recount in that race, which had a margin of 0.41 percent. Gillum, who conceded on election night only to retract his concession later, said in a statement that "it is not over until every legally casted vote is counted." The overall recount has been fraught with problems. One large Democratic stronghold in South Florida could not finish its machine recount by the Thursday deadline because of machines breaking down. A federal judge rejected a request to extend the recount deadline. "We gave a heroic effort," said Palm Beach Supervisor of Elections Susan Bucher. If the county had three or four more hours, it would have made the deadline to recount ballots in the Senate race, she said. Meanwhile, election officials in another urban county in the Tampa Bay area decided against turning in the results of their machine recount, which came up with 846 fewer votes than originally counted. 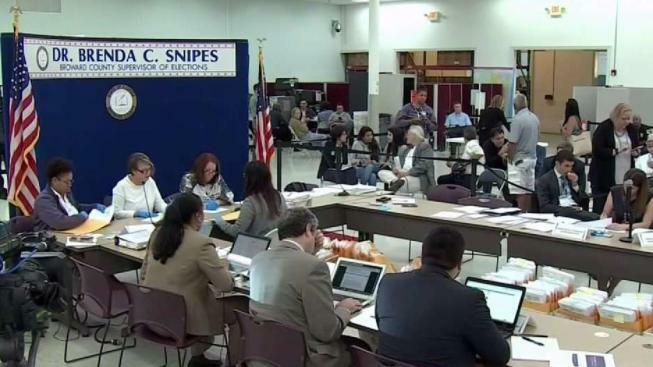 Broward County missed the deadline to submit its machine recount results by two minutes, but it finished its manual recount in just a few hours, which Elections Supervisor Brenda Snipes attributed to the large number of volunteers assembled for the task. Scott called on Nelson to end the recount battle. It's time for Nelson "to respect the will of the voters and graciously bring this process to an end rather than proceed with yet another count of the votes — which will yield the same result and bring more embarrassment to the state that we both love and have served," the governor's statement said. The margin between Scott and Nelson had not changed much in the last few days, conceded Marc Elias, an attorney working for Nelson's campaign. But he said he expects it to shrink due to the hand recount and the ruling on signatures. Two election-related lawsuits are pending in federal court in Tallahassee. The situation drew the ire of U.S. District Judge Mark Walker, who slammed the state for repeatedly failing to anticipate election problems. He also said the state law on recounts appears to violate the U.S. Supreme Court ruling that decided the presidency in 2000. "We have been the laughingstock of the world, election after election, and we chose not to fix this," Walker said at a hearing Thursday. Incoming Florida Senate President Bill Galvano said Friday that lawmakers will discuss changes to the state's election laws. By the next election cycle, he said, "voters are going to want to have more in terms of assurance that their votes are going to be properly counted." Late Thursday, Walker rejected a challenge by Nelson and Democrats to the rules of the hand recount in the Senate race. Walker found the state's rules were reasonable and constitutional. Walker also ordered that voters be given until 5 p.m. Saturday to show a valid identification and fix their ballots if they haven't been counted due to mismatched signatures. Republicans challenged this order and were turned down by an appeals court. State officials testified that nearly 4,000 mail-in ballots were set aside because local officials decided the signatures on the envelopes did not match the signatures on file. If those voters can prove their identity, their votes will now be counted and included in final official returns due from each county by noon Sunday.